Although I watched the NBA Finals from my couch, trying to digest everything that was happening between the Heat and Thunder left me feeling worn out. This exhaustion was probably due to some combination of the contrived narratives that floated around throughout this series, the frenetic pace every game was played at, everything about the “Russell Westbrook experience”, Scott Brooks being Scott Brooks, and of course, listening to people criticize LeBron for weeks on end regardless of what he did. There was a lot happening both on and off the court, but the one thing I’ll remember about this series above all else was that we got to see two players who have the potential to be regarded as all-time greats by the time their careers are over (Kevin Durant and LeBron James) go toe-to-toe for the most coveted prize in professional basketball. The other thing that I will remember about this series is that it was the first time LeBron put all of the pieces together and reached his seemingly limitless ceiling to bring home a title. In other words, we witnessed one of the greatest players in NBA history maximizing his potential. And it was incredible. Whether or not LeBron can build off his first title run to pile up the championship banners in the coming years is something we simply don’t know right now, but at the very least, we saw him become the player we all know he’s capable of being; an unstoppable 6’9’’ 260 lb. force of nature who has absolutely no weaknesses on a basketball court. I originally started writing an article in which I attempted to explain why rational basketball fans dislike LeBron so much (for reasons other than “The Decision”), but I got about 1,200 words into it and I just couldn’t re-hash the already belabored topic anymore. The conclusion I was trying to reach was that basketball fans who hate LeBron probably do so because they get frustrated when a guy who has the potential to be one of the five best players ever, doesn’t deliver. So much of our lives are so stiflingly mediocre and uneventful that when we see someone who has the ability to make us forget about reality for a little while and let us enjoy their greatness, we crave the deviation from average that most of us experience basically every minute of every day. Ultimately, I got tired of trying to figure out why rational basketball fans dislike LeBron, so I dropped the article. Enough of trying to get to the bottom of why people don’t like him, because after LeBron averaged 30.3 points, 9.7 rebounds, and 5.6 assists (while, contrary to Serge Ibaka’s assessment, also playing very good defense) in helping the Heat win their second title in franchise history, there really isn’t much his critics can say about him. Playing perfectly into the Alex Rodriguez/Dirk Nowitzki corollary (which is when a superstar's detractors say he isn’t clutch and can’t win big games just because he has failed to do so in the past), LeBron took control of the Finals and led the Heat to a championship over an extremely talented Thunder team. He’s not the first athlete to be arrogant/cocky about what he is capable of doing on a basketball court, but we hold athletes who are the best of the best to higher standards. We expect that these players will go about their business and quietly thrash everyone who stands in their way of a title, but as a culture we’d rather not see them celebrate like they’re the sixth guy coming off the bench. Essentially, celebrating this way and being arrogant aren’t qualities many of us feel are fit for a player of LeBron’s immense talents. But when you consider the performance LeBron just authored, and the fact that he’s only 27 years old, it seems like there’s going to be a lot more celebrating in LeBron’s future. LeBron isn’t Tim Duncan. He’s not going to systematically pick you apart and stoically hug his family and the Larry O’Brien Trophy after his team has won the championship. That’s just not who LeBron is. The premise of the movie “Swingers” is that Jon Favreau is a great guy but he doesn’t have the confidence to approach women after his girlfriend of six years broke up with him. Throughout the beginning of the movie his friends casually try to tell him he’s “so money, and doesn’t even know it,” but Favreau’s character rebuffs these comments. About an hour into the movie, after Favreau strikes up a conversation with a girl at a bar only to report back that he made a fool of himself and the she didn’t like him, this sends Vince Vaughn's character into overdrive. What results is one of my favorite scenes of any movie. The pep talk that Vaughn gives to Favreau is so impassioned that he works up the courage to go back up to the girl and, of course, he gets her number. After watching LeBron fail in the playoffs for the last few years, it seems like he was destined to crumble at the biggest moment once again when the Heat lost Game 5 to the Celtics and were one game away from elimination. LeBron responded with one of the more dominant playoff performances in recent memory with his back against the wall in Game 6 (45 points on 19/26 shooting, 15 rebounds, and 5 assists), and as we all know, the Heat would lose just one more game during the rest of the playoffs. 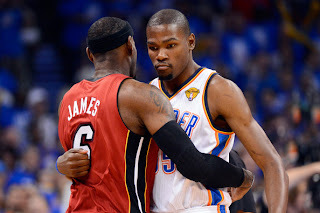 What happened between Game’s 5 and 6 of the Eastern Conference Finals that propelled LeBron to take no prisoners is anyone’s guess, but I think he received a pep talk from “Trent” right before he took the floor against Boston on June 7th. Yeah, that’s probably how it went down. Even when you forget about the criticism that many have heaped on Russell Westbrook (either fairly or unfairly), watching him fly around the court during the NBA Finals was equal parts amazing and agonizing. Amazing because there are maybe a handful of basketball players in the world right now who could turn in the Game 4 performance he authored, and agonizing because he’s just 23-years-old and sometimes his age is extremely apparent. 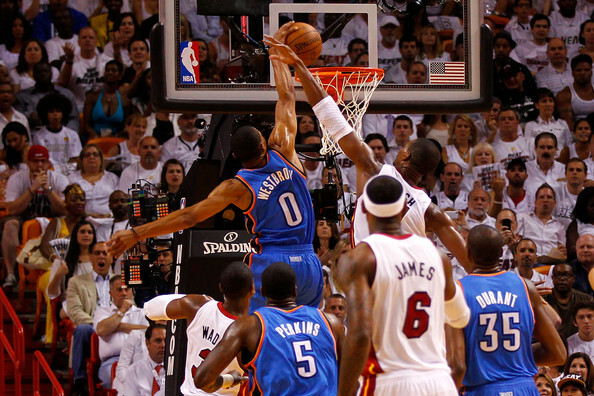 Regardless of how you feel about Westbrook, it’s impossible to deny that he’s one of the NBA’s bright young stars, and if him playing the game of his life in Game 4 when the Thunder desperately needed a win didn’t convince his critics to let Westbrook be Westbrook (to borrow the phrase from @HPBasketball), I don’t know if anything will. Everyone who has watched him play knows he’s not a traditional point guard, but considering the surrounding pieces on the Thunder’s roster, OKC needs him to be more of a scoring point guard anyway. Yes, Kevin Durant is the NBA’s best scorer and you want the ball in his hands as much as possible, but he can’t take every shot for the Thunder. When you consider that besides Durant, the other players on the court for the Thunder were some combination of Kendrick Perkins, Serge Ibaka, Thabo Sefolosha, Derek Fisher, Nick Collison, and James Harden, Westbrook needs to look for his shot for this team to be successful. If the shot clock is running down, and it comes down to either Westbrook or any of the players I just rattled off (assuming that Durant can’t get open, more on that later), the only other player you could make a case for taking that shot is Harden, and with the way he played for much of the Finals, Westbrook was the better choice. When things are going well for Westbrook, he’s nearly as unstoppable and deadly as Durant on the offensive side of the floor, and when he’s making bad decisions and playing out of control, it often makes him standout as the reason why the Thunder don’t win. But here’s the thing, if you’ve watched the situations in which Russell Westbrook has to jack up a contested shot with the shot clock running down, it’s usually the best option the Thunder had. At least it was during most of the NBA Finals. The bottom line is that Westbrook is quickly becoming one of the most interesting and polarizing players in the NBA, and he’s also one of the league's most talented as well. Even if he does play alongside Kevin Durant, and he does make his share of bad decisions. When a guy is consistently scoring 30 points per game, and he makes it look as effortless as Kevin Durant does, there isn’t much to criticize about his game. However, if you were watching the Finals (and other rounds of the playoffs for that matter) closely, you saw Durant struggle at times to free himself from physical defenders who were determined to deny him the ball. Durant’s numbers were obviously still there (he averaged 30.6 ppg against the Heat), but there were more than a few crucial possessions where he simply wasn’t able to get open. As I just discussed, this put Westbrook in a tough spot, and often left him to chose between passing the ball to Ibaka/Perkins/Sefolosha/Fisher/an uncharacteristic Harden or shooting himself. Because of his amazing ability to hit difficult shots over defenders, whenever Durant gets the ball it’s essentially game over for anyone trying to stop him. However, it’s become clear that teams are putting their most physical wing defender on him and making it a priority to deny Durant the ball as much as possible. If Durant’s game has a weakness, it’s the fact that he has trouble dealing with physical ball denials, but the fact that he will no doubt one day conquer this issue (much like when Dirk got stronger and tougher to deny the basketball to later in his career, or how LeBron worked on his post game to take advantage of smaller players guarding him) is an incredibly scary thought for the rest of the NBA. Of course, it’s not all Durant’s fault. 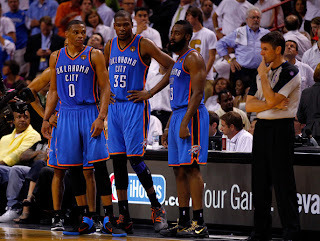 It wouldn’t hurt if Russell Westbrook worked on his entry passes a little more, and Scott Brooks also has to do a better job of recognizing what opponents are trying to do to Durant and help figure out ways to free up the most lethal scorer in the NBA when other teams are clearly predicating their defense on freezing him out of the Thunder’s offense. Plenty of people have said that Russell Westbrook shoots too much when he should be deferring to Durant, and I won’t argue with those who feel this way, but on the majority of the possessions when Westbrook takes a shot he probably shouldn’t take, you can see Durant standing in the corner blanketed by a defender. With the Heat leading the series 2-1 going into Game 4, everyone knew how crucial this game was to the outcome of the series. If the Thunder managed to win, they would have knotted the series at two games apiece and you have a best of 3 on your hands. If the Heat win Game 4 they’re sporting a 3-1 series lead that makes them the overwhelming favorites to take home the title. Plenty of things took place during Game 4 that made it one of the more surreal basketball games I’ve seen in a long time, and right beside Russell Westbrook simply taking over and carrying the Thunder on his back, was LeBron posting up James Harden (for what seemed like 7 straight possessions) without anyone on the Thunder doing much to help. I understand that at this point in the series the Thunder had basically run out of ways to guard LeBron, and Scott Brooks decided he would rather have 6’5’’ 220 lb. James Harden covering a player who has four inches and 40 pounds on him rather than risk getting Durant in foul trouble or having Sefolosha’s sub-par offense in the game. But at some point a strategy other than “we’ll just let LeBron manhandle Harden in the post” should probably have been considered. It wasn’t even so much that LeBron scored a ton of points on Harden in the fourth quarter, but it was an easy way for Miami to initiate their offense, and just watching the game you knew he could take advantage of this favorable matchup whenever he wanted. 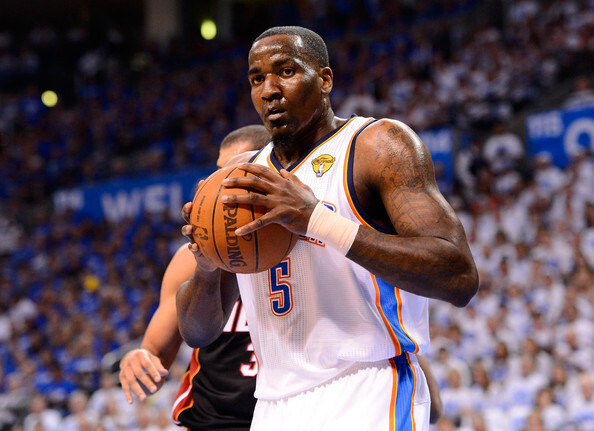 Kendrick Perkins has never been a player who posted impressive stat lines, but he was always capable of doing the dirty work around the basket. However, there’s little doubt that Perkins presence on the court during much of the NBA Finals hurt the Thunder more than it helped them. Having recently found out that he was playing with a partially torn groin isn’t stunning news, but recognizing that the Heat are a terrible matchup for the style of basketball that Perkins plays is also worth noting. For the last eight years, Perkins has made his living doing battle with opposing bigs in the paint, but when a team like Miami plays the entire series without a traditional center, having a guy like Perkins on the court is pretty much pointless. Chris Bosh was the closest thing to a center that Miami gave substantial minutes to, and because he could stretch the floor with his shooting, Bosh was a terrible matchup for Perkins. 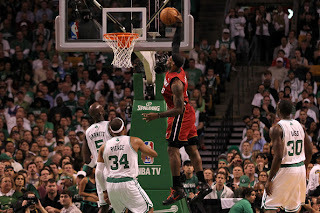 Other than Bosh, the only post player on Miami who saw any minutes was Udonis Haslem, and he played sparingly. 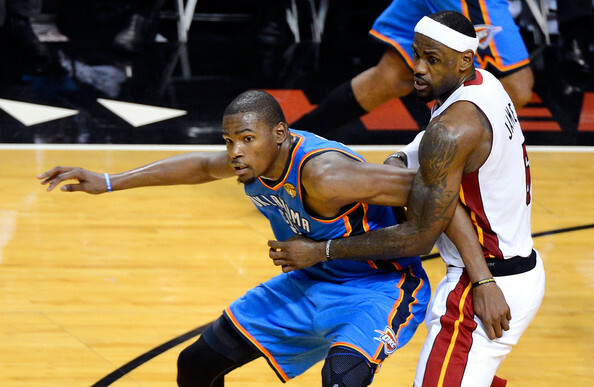 This left the Thunder with a big man who isn’t mobile enough to cover the Heat’s shooters, wasn’t athletic enough to challenge players like Wade and LeBron at the rim, and wasn’t skilled enough offensively to make the Heat pay for being so undersized on the opposite side of the court. This led to Perkins constantly hurting the Thunder, and led many people to question why Scott Brooks insisted upon playing a guy who was basically obsolete against Miami. Of course, if the Heat had a dominant back-to-the-basket big man, Perkins would have been a huge asset for the Thunder, but at least his ineffective play prompted one of the best comments about an article I’ve seen in a long time (scroll down to the first comment in that article). 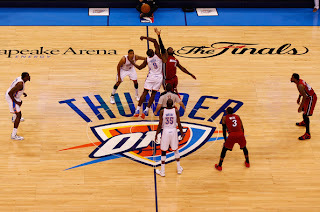 If you believe in making excuses for certain teams while looking at their situation in a vacuum, the fact that the four best players on the Thunder were all under the age of 24 and none of them had ever been to an NBA Finals seems like the perfect reason why they came up short against the Heat. Not that any of the players on the Thunder were pointing to their youth as a reason why they lost the series, but the it's nearly unprecedented that such a young team has experienced this much success (off the top of my head, I came up with the 94'-95' Orlando Magic, who were led by a 23-year-old Shaq and a 22-year-old Penny Hardaway and also lost in the Finals as a comparison. But even that team had steady veteran contributors like Horace Grant, Nick Anderson, and Dennis Scott). After they lost to the Mavericks in the Western Conference Finals last year, I wrote an article for SIIJ about how the Thunder had reached the point of no return regarding the expectations they would face going forward. But even considering the lofty expectations the Thunder played with during the 2012 playoffs, it’s hard to say that their season was a failure. OKC beat the Mavericks (Nowitzki), Lakers (Kobe), and Spurs (Duncan/Ginobili/Parker) and made the Finals for the first time in franchise history since Shawn Kemp and Gary Payton led the Sonics there in 1995. At the same time, this Thunder team was talented enough to win it all and they came up short for the second year in a row against a more experienced team. OKC learned enough from their loss to the Mavericks last season to emerge from the West this season, but they couldn’t figure out a way to topple LeBron and the Heat when they got to the Finals. Is it unfair that many people expected a starting lineup whose ages were 23, 23, 28, 22, and 27 to win a championship this season? Yeah, it probably was, but we’ve already seen way too much from Kevin Durant, Russell Westbrook, James Harden, and the rest of the Thunder to not have even higher expectations for them next season. As ridiculous as it sounds, when you factor in that Harden and Ibaka’s contracts expire at the end of next season, people will start talking about how the Thunder’s title window is closing and everyone will expect them to win now that they’ve been to the Finals once and lost. That’s just the way sports are. There are a few teams who could potentially challenge the Thunder in the Western Conference, and maybe someone emerges out of the East to give the Heat a run for their money next season, but is there really any reason to think that either of these teams won’t make it back to the Finals next season? Both the Heat and Thunder return basically everyone of consequence from last season (the biggest free agent loss for either team is Derek Fisher), and both teams have late first round picks in a stacked draft that could nab them a nice role player. Furthermore, in what has to be an extremely scary thought for the rest of the NBA; all of the star players on the Heat and Thunder are either in their prime or still ascending to the top. 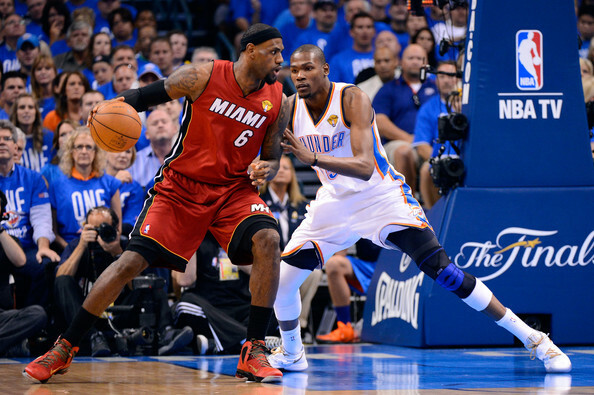 Perhaps the best argument for either one of these teams not reaching the Finals in 2013 would be that LeBron, Wade, Bosh, Durant, Westbrook, and Harden tire themselves out winning a gold medal for Team USA in the 2012 Olympics and are worn down by the time the playoffs come around next season. All of that plus the jaw dropping athleticism and fast pace that made this series so much fun to watch. If this does happen, basketball fans should be thrilled with LeBron-Durant II, or whatever we end up calling it. Wherefore Art Thou, Ryan Zimmerman?